I already made this as an oven dish instead of a Mexican tortilla pie. Since I used the same ingredients, the taste was good, but it looked like a battlefield. 😉 Since I wanted to eat it again, I was thinking of a way to present it better. That’s when I thought of using a spring cake tin, perfect for round tortilla wraps. Plus it’s way easier to divide the filling between the tortilla wraps. I prefer to eat it with creme fraiche and jalapenos on the side. I consider this a healthy recipe since the only fat part is the cheese on top. preparation 15 minutes, cooking time 45 minutes. Preheat the oven to 200 degrees Celcius, hot air. Rinse the Kidney- and black beans with water and drain them. Drain the liquid from 1 can of tomatoes and the corn. Dice the onion. Put 1 tortilla on a cutting board en place the ring of the spring cake tin on top of it (with the latch closed). Cut the tortilla following the inside of the ring. Repeat with the other tortillas. Place the ring back on the bottom and close the spring. Heat some vegetable oil in a big frying pan. Cook the onion for a few minutes. Add the minced meat and stir until browned. Now insert the tomatoes, 50ml of water and stir in the fajitas seasoning mix. Let it simmer for a few minutes. Insert the beans and corn and mix it all together. Use chili powder to season the dish to your own taste. Start with 1 tortilla in de spring cake tin followed by a layer of the bean mixture. Place another wrap and continue. Make sure to end with a layer of the bean mixture on top. I used 5 wraps and didn’t have any mixture left. Sprinkle the cheese over your Mexican tortilla pie and place the pie in the middle of the oven for about 25 minutes. 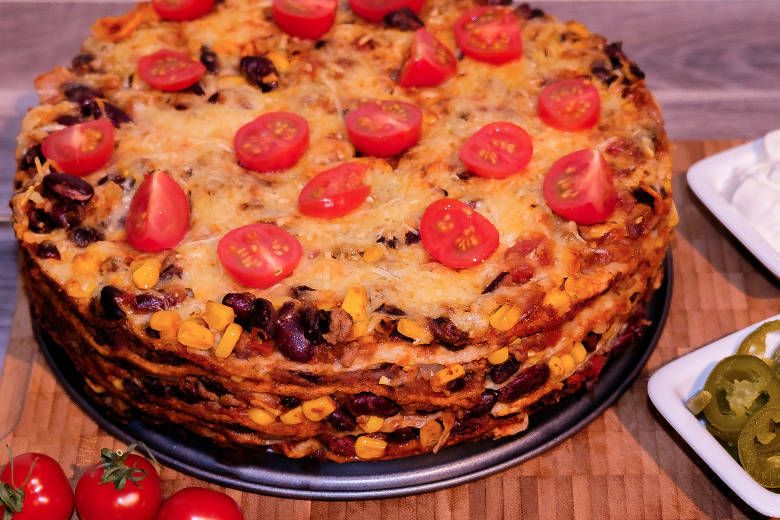 Cut some cherry tomatoes, place them on the Mexican tortilla pie before serving. You can also bake them along. I prefer not to do that. I don’t like warm fresh tomatoes. 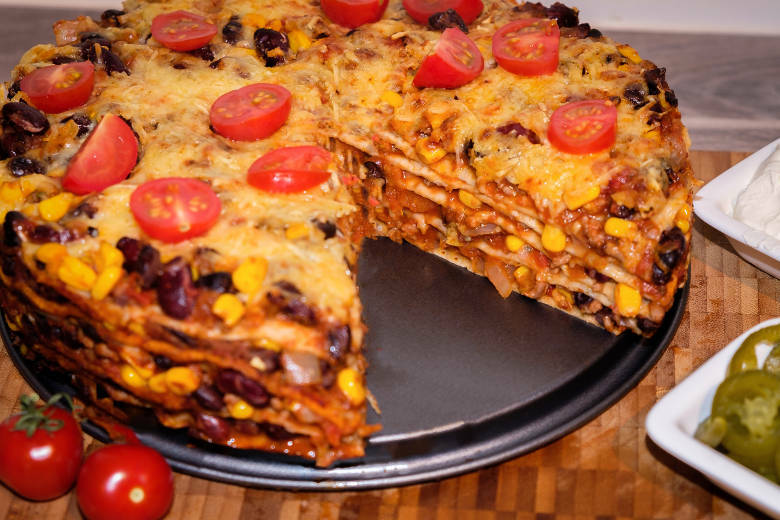 Enjoy your Mexican tortilla pie.